TOWANDA -- It was 125 years ago today that five nuns arrived in Towanda to found a Catholic school and serve as its teachers. They had been asked to come to Towanda by the Rev. Charles Kelly, pastor of Saints Peter and Paul's parish in Towanda, who "felt very strongly that there should be a Catholic school associated with his parish," said Ann Cowling, principal of St. Agnes School. 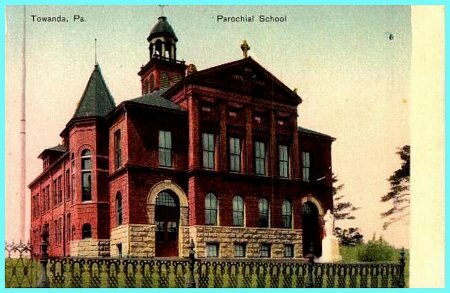 At the time, no Catholic schools existed in Bradford County. A few weeks after arriving in Towanda, the nuns opened Saint Agnes School in Towanda, which is celebrating its 125th anniversary this year. Saint Agnes School currently serves 198 students in grades pre-Kindergarten through 8th. 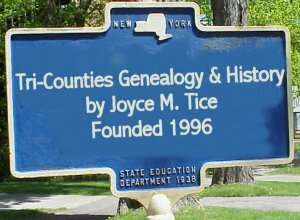 The following account, prepared by Bradford County Historical Society President Henry Farley, describes the arrival of the five nuns in Towanda, the founding of Saint Agnes School and the history of the school during its later years. Sept. 6, 2002 marks the 125th anniversary of the arrival of the Religious Sisters of Mercy in Towanda. The sisters were members of the order of The Sisters of Mercy founded in Ireland in 1827 by Catherine McAuley. They had established convents in the Scranton Diocese in Hazleton and Wilkes-Barre, Towanda being the third house opened by the sisters in the 1870s. The group of five sisters who arrived in Towanda were sent from the Mother House in Pittsburgh via Wilkes-Barre, where they were met by Sister Mary Regina the Superior of the order in that city. The group of sisters accompanied by Rt. Rev. William O'Hara, Bishop of Scranton; Rev. D. O'Haran, pastor of St. Mary's Church, Wilkes-Barre and Rev. Kelly, left Wilkes-Barre at 7 a.m., and after a very pleasant ride they reached Towanda at 11 a.m. The depot being about a mile from the new convent, open carriages were awaiting them. Father Kelly wanted the people to see the sisters as they drove through the town. They reached the dwelling house on Third Street at 11:30 a.m.
Father Kelly had the education of youth very dear to his heart. On his own personal responsibility, he borrowed $9,000 from relatives and purchased the Christopher L. Ward property on Third Street to be used for a convent and school for the parish. "The site was a beautiful one, the grounds surrounding the 18-room building were spacious. The house had been the property of a noted and enterprising gentleman who settled in that portion of the state toward the close of the eighteenth century. In the time of President Buchanan he was one of the most prominent politicians in the county. From time to time he had made improvements and built additions to the house modeling it as nearly as possible on the English style in vogue in his day. "Having died very suddenly in 1870, his vast wealth, both in real estate and U.S. Bonds, was left to the mercy of one male heir who was a profligate son. This son was not slow in undoing all, that the father had taken years, to put together. A few months previous, the zealous pastor rescued the ruin from entire destruction, in order to have a suitable place for the education of his parish children. The house itself with a little repairing was well adapted to a Convent and Academy (for music and art instruction), while the spacious and well-built barn could with a little remodeling be converted into classrooms for the parish school." The sister went on to tell that the local people were glad to have the house occupied as there had been a murder there and no one had the courage to live in it. The universal belief was that the house was haunted. The original group of sisters that were brought to Towanda by Mother Regina numbered five. The names of four of those sisters are known: Sister Mary Clement Confer, who is known by the Sisters of Mercy as the 'foundress of Saint Agnes convent', Sister Mary Imelda, Sister Mary Sylverius and Sister Mary Ildelphonse. Sister Mary Ildelphonse was in charge of the Academy where music and art would be taught and Sister Mary Clement the school. Mother Mary Regina stayed with them for a few days before returning to Wilkes-Barre. Before her departure, the name Saint Agnes was settled upon for the convent. The new mission was from then on under the patronage of the Holy Child Saint Agnes. This was the beginning of the Saint Agnes School, which was run under the direction of the Sisters of Mercy from 1877 to 1992. 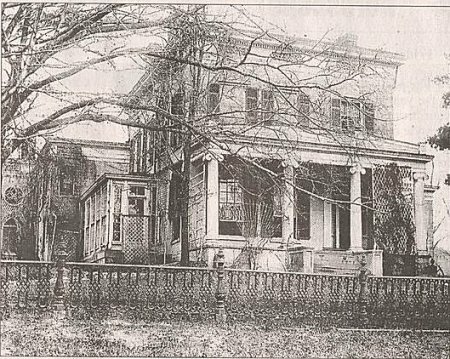 The Christopher Ward mansion remained the home of the Sisters of Mercy until September 1971. The building had been enlarged in the early 1900s to 42 rooms to accommodate 10 sisters and girls from the surrounding countryside who wanted to board while attending Saint Agnes School. In 1971, there were only four sisters assigned to Saint Agnes School and the convent at the time was too large and in need of very expensive repairs. So a decision was made by the parish to purchase the old Charles Foyle Home at 100 Third Street (believe this should read 104 Third Street) and convert it into a convent for the sisters. The Ward Mansion stood empty and by what was thought to be arson a good portion of the building burned in May 1972. There was little to salvage after the fire and the structure was torn down soon afterwards. 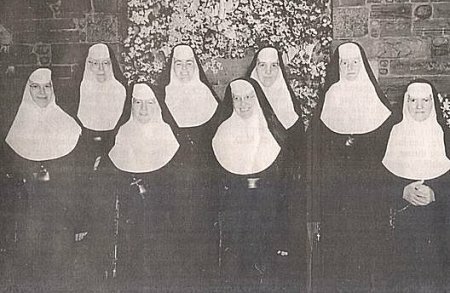 In September 1977, the Sisters of Mercy celebrated 100 years in Towanda with a Pontifical Mass followed by a reception and dinner. Many of the former sisters who were assigned to Saint Agnes returned for the event. There were also many young ladies who graduated from Saint Agnes School who chose to enter the order of Sisters and they returned for the celebration as well. The sisters continued on at Saint Agnes until 1992 when Sister Rose de Lima Moran -- the last sister to teach at Saint Agnes School -- returned to the Mother House in Dallas, Pa. 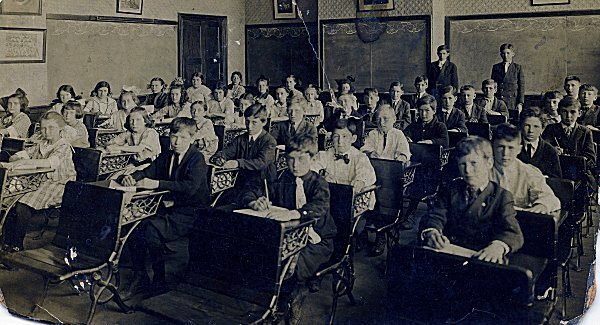 This ended 115 years of continuous education by the Sisters of Mercy who taught thousands of Bradford County children. Their memory will live on through their former students who speak highly of the education they received while attending Saint Agnes. Today, the Rev. Ronald Hughes is pastor of SS. Peter and Paul's parish and is in charge of the school. A staff of excellent teachers assists Principal Ann Cowling in running the school. An all class reunion and anniversary celebration is planned for Oct. 13. Many of the Sisters of Mercy who taught at the school will be attending the Mass and celebration. Former pastors and assistant pastors have also been invited to attend. 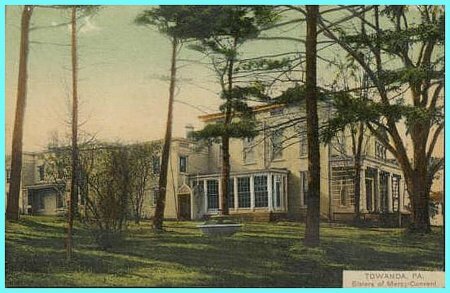 (1) Pictured is the St. Agnes convent as it appeared after additions in the early 1900s. The building looked like this until it was destroyed by fire in 1972. (2) Sisters of Mercy as St Agnes in 1954. Back row, from left, Sister Mary Agnes Killkelly Superior and music instructor; Sister Mary Josette Lewis, third and fourth grade; Sister Mary Miriam Rita Biter, seventh and eigth grades; Sister Mary Agnita Cawley, native of Towanda Township and St. Agnes High School graduate; class of 1914, fifth and sixth grades. Front row, from left, Sister Mary Florita Maloney, principal; Sister Mary Iraneaus Finn 11th and 12 grades; Sister Mary Bernita Smith, ninth and 10th grades; Sister Mary Ildelphonse Washcalus, first and second grades. (3) Sister of Mercy – and sisters in secular life – the Frawleys, natives of Overton Township, graduated from St. Agnes School. 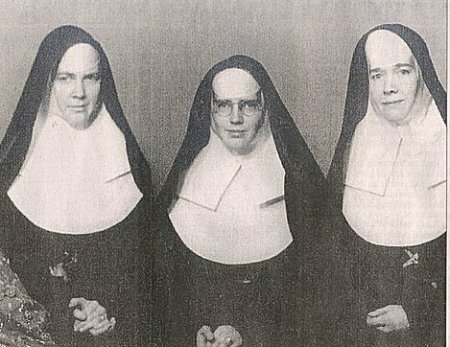 From left, Sister Marie Jose (Christine, class of 1928); Sister Mary Gratia, (Grace, class of 1934); and sister Mary Valeria (Catherine, class of 1930). All three sisters taught at St. Agnes during their teaching careers. Sister Mary Valeria and Sister Mary Gratia currently live at Mercy Center in Dallas, Pa. Sister Maria Jose is deceased. The attached photos were in a box that belonged to my Grandparents, James Lamont Brown and Rowena Anna McIntyre Brown. The photos were taken at the Saint Agnes School, my Grandmother Rowena McIntyre is in the first photo, she was born in 1901, her sister Kathleen McIntyre is in the second photo, she was a couple of years older.